winnie & walter blog: Gayatri's First w&w Post! Hey everybody, Gayatri here today. This is my first post as Winnie & Walter talent. I have a card share for you using the new release stamp sets – Bubble Talk, The Write Stuff: Picture Perfect. I have also used the cut files from The Write Stuff: Picture Perfect. I have made a card base which is 4’ x 5 1/2’ in size. Trimmed a white cardstock to the size of the card front which is 4’ x 5 1/2’. I have stamped the camera twice slightly overlapping and at an angle using Memento Black Ink. Then coloured using Copics markers by adding brush strokes leaving a lot of white space and not colouring the entire camera with colours. I stamped the flash stamps in the same colour I used on the camera. Tiny sentiments from The Write Stuff: Picture Perfect stamp set are stamped towards the bottom right. Now I trimmed the card panel right through the stamped camera. I know! It is shocking, right? It took me a while before I decided to trim. Lol! I placed the trimmed panel on the card front to leave a gap in the middle so I can stamp the speech bubble and sentiment. I trimmed off the excess from the panel. I placed the panels back on the card front and drew an outline for the gap using the pencil. Then stamped the speech bubble and sentiment on top of the speech bubble. Erased the pencil lines. I then adhered the camera panels using foam adhesives. Using Silhouette machine I die cut the frame and adhered it to the card front such that it frame the sentiment. Finally used sequins that Shay sent me to accent my card. I love the colours with a lot of white space. Hope I have inspired you to make a card today. Have a wonderful day and fun crafting. Such fun stamping! 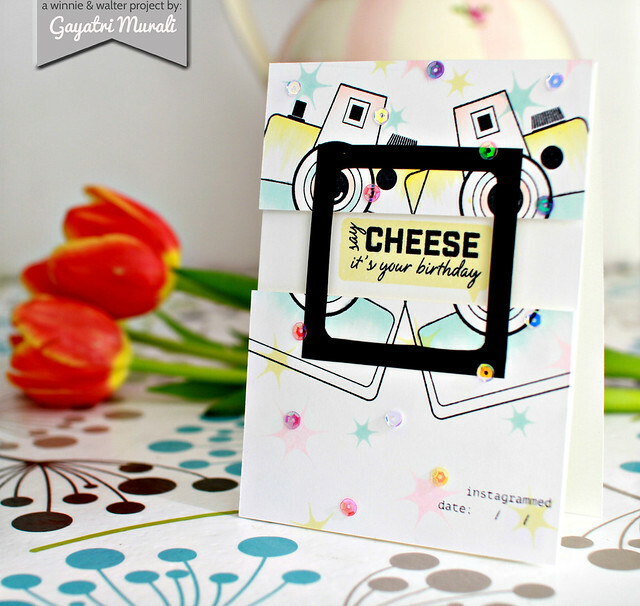 Love your card Gayatri! Wow! This is a fun card!!! Such a cool design, love this FUN card!!! congrats on your first post here...love love the card! Oooo! Love this. Beautiful colors and design. Well done!! What a pretty card! Congrats on your first post; looking forward to more! Oh, this is AWESOME!!! Love the layout and colors...simply, stunning! Gorgeous card! Love the colours and amazing design!